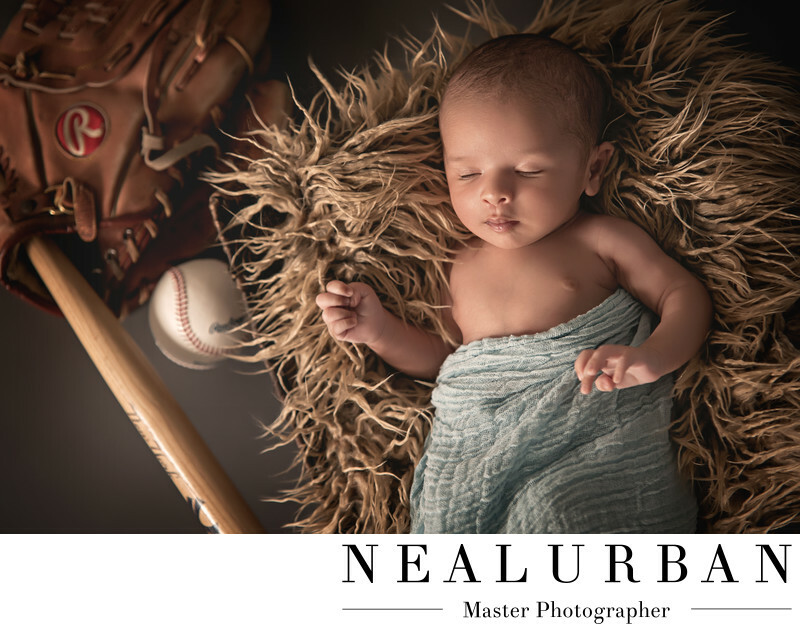 For newborn sessions at Neal Urban Studio, we always like to talk to the parents about ideas. We like to brain storm together and be on the same page. Once we get a theme together, we start to think sets and props. We always tell the parents to bring in what ever they want too. For this session dad was a big baseball fan. Actually a Yankees fan. He did have some yankee gear we used for some other shots, but for this, we wanted basic baseball. This newborn baby boy had such a great skin tone as well. He already had a tan! We kept him in the blue wrap so he didn't blend in too much with the throw blanket. Everyone was on the brown side. We needed some color. Sometimes newborns are very fussy and do not want to sleep. For this guy, he wanted to stay awake and hang out. We do newborn sessions within nine days of the birth. This was after a few weeks, so we knew he was going to be a curious little guy. But that was ok. We got some beautiful portraits. When he did fall asleep, we made sure to get as much as we could with the baseball props. Sometimes all it takes is the baby to sleep for a solid ten minutes to get the shot!